Dribbling down the court as the clock ticks down, the pressure is on for No. 4, senior AJ Green, and his teammates. He moves swiftly side to side, passing the ball, trying to get open. With the crowd roaring, each student section cheering and sweat rolling down his face, Green’s hands are back on the ball. 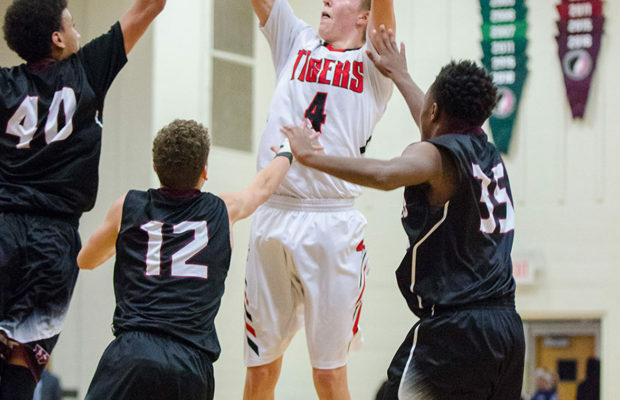 In just a few short moves, Green takes charge and shoots for the winning basket in the last few seconds of the 2016 game against Linn-Mar High School, leading his team to State. “That will always stick with me. That was such a big moment in my career,” Green said. Recently, Green decided to continue his career by playing at UNI after graduation from the high school, and he reflected on what the past has held held for him and what he has yet to achieve. Green started playing basketball was he was just five years old. His parents signed him up to play in rec league and wanted to get him into the game at a young age. “We’re a basketball family and I was pretty good at it, so I just kept playing,” Green said. After playing travel ball through grade school and junior high basketball, Green said in seventh grade he figured out if he worked hard enough, he could go somewhere with his basketball skills and take things to the next level. 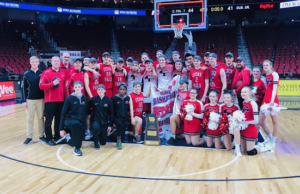 Looking back on some of the basketball memories, Green said playing AAU travel ball with the Barnstormers has given him a lot of opportunities to travel all over the country and experience so much that others don’t get to see. Green, his family and his travel ball team have taken many trips such as Las Vegas, South Carolina, Dallas, Atlanta, Kansas City, Indiana, Milwaukee and lots more. Green said he also enjoys the traveling and seeing new places, so, that is a definite perk when being away from home. Being ranked the 74th player in the country out of 100, a top 20 point guard in the country and second in the state of Iowa, Green’s name in on every list possible. In June of this summer, Green was invited to the NBA Top 100 camp at the University of Virginia in Charlottesville, Va.
Green said he has been to numerous camps over the years, but this one was the biggest yet. The camp is put on by the National Basketball Players Association, and the top 100 players in the country are invited. This camp paid for travel expenses, food and staying at the dorms, and the players also received basketball gear. Green said that over the many camps he has been to, the NBA Top 100 was his favorite by far and a successful time playing basketball. In summertime, when he’s not at big basketball camps, he is working out with the high school basketball team at team camps, scrimmages, attending open gym, lifting when school kicks in and sometimes he even goes in early in the morning to get a workout in before school starts. Basketball coach Ryan Schultz, said Green cares so much about the game and about their team. He said that one of the best and most rewarding things about being a coach is seeing a kid develop over the years and being able to help along that player’s journey to achieve their goals by doing it the right way. Schultz also mentioned Green is one of the rare kids where one can immediately see they have something special in them, and Green was definitely one of those kids. “He works at his game when he doesn’t have to and when nobody is watching. He doesn’t take days off,” Schultz said. Because of all his hard work and commitment to the game of basketball, Green is driving to set a new record for total points scored in high school career. The record is held by James Harrington of 1,409 points total. Green is at 1,100 points and has a goal to set a new record. “That should be easy to break. Usually I have at least 400 points a season,” Green said. With his senior year and season ahead, Green said he is ready for what the future has in store. Friday, August 11, 2017, Green made his final decision and committed to continue his education and basketball career in his hometown at the University of Northern Iowa for the fall school year of 2018. The colleges that were interested and were trying to recruit Green were Gonzaga University, Michigan State University, University of Southern California and Indiana University. The colleges that offered to Green were University of North Dakota, South Dakota State University, University of Nebraska, University of Virginia, Clemson University, University of Minnesota, Iowa State University and University of Northern Iowa. Freshmen year, Green received his first letter, and in the spring of his sophomore year, letters kept coming in, and by the time sophomore year ended, a first offer was on the table. In the fall of his junior year, Green started visits to Iowa State and Minnesota. In the midst of his junior year, offers, camps, visits and letters swarmed the 6’4” basketball star, and the process unfolded. A main factor, Green said, with choosing UNI as a home of four years is that he has grown up around the program his whole life. “I really feel comfortable with all the coaches, the players and the plan of the future in what we could do,” Green said. Green also mentioned it is very important to him that his family is able to watch him play the sport he loves and be alongside his journey. Green admitted it was a tough decision to make with all the offers coming in, and the process wasn’t easy, but his decision to commit to UNI was definitely what he wanted to do. He said his parents have been his biggest supporters from when he was just a kid shooting baskets in the backyard. Schultz said he is excited for Green and his family. “I was excited for UNI and the community, and, selfishly, I was excited about the fact that I would be able to go watch him a lot over the coming years. In the end, UNI is a great program. It’s home, and I think AJ will flourish there,” he said. Green’s mother, Michele, joked that she is glad she won’t have to buy new colors and is excited for his next adventure. “When he was, I think, two years old, he had a little basketball and hoop, and he would not stop shooting. AJ would just get mad whenever he’d miss and would not stop until he made a basket,” she said. Green’s mother said when giving both her kids advice throughout the years, she hoped they would learn to work hard and dream big. “I think with the combination of those things, it can take you far in life,” she said. With his dad being the assistant men’s basketball coach up at UNI, Green said his dad sees the coaches’ side of the process all the time, and it really helped a lot in what to say and do with making a decision. Green said it doesn’t matter for basketball or whatever sport someone is playing that if you work hard enough for what you want, it will pay off in the end. His ultimate end goal and dream is to play professionally after college in the NBA or overseas in Europe. Once Green is done playing basketball far into the future, he said his next journey will be coaching basketball. As the last seconds of Green’s high school career as a Tiger come to an end, he will still confidently trot on the court, his jump shot will still extend over his head, the ball will still graze the net and buzzer beaters will still be imprinted in fans heads, but this time as a Panther.